Oops - we don't appear to have a video for the i250. I should say it was a pleasure doing business with your organisation. Everybody I spoke to was polite and helpful. It took me a few days to install the machine which was a bit bigger than I expected but once installed it performed well and looks like it will do the job admirably. The operators are not IT trained people but have picked up the requirements quickly and do the job well. Where scanning in colour or grayscale is as fast as scanning in black and white. Where loads of image processing functions come standard. And where a fast, plug-and-play IEEE-1394 (FIREWIRE) interface speeds your images on their way. The i250 will change the way you look at desktop production scanning. Sometimes you need a flatbed, but many times you don't. That's when our dockable flatbed design saves valuable workspace. Just "dock" this accessory to your i250 and easily cruise through all your exception scanning items. When you're done, the flatbed detaches just as easily for storage away from your desktop. But don't hide it, because a detached flatbed can serve the needs of multiple work groups or departments. Sharing is good, and in this case, it's more economical, too. Colour Scanning that won't slow you down, or cost you more. The Kodak i250 document management scanner delivers the fastest colour scanning in its class - up to 134 images per minute - at a price you're accustomed to paying for a black-and-white-only model. And if your forms processing workload includes non-essential background objects, our electronic colour dropout feature lets you easily eliminate lines and shaded boxes, making automated data extraction more accurate. With imaging options like these, desktop production scanning never looked so good. 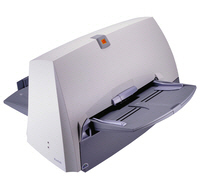 With the i250 (simplex) model, you get our exclusive Perfect Page Scanning. This suite of built-in technologies automatically makes colour, grayscale and bitonal scans incredibly clear, for excellent readability - by people and OCR software alike. You also get bundled ISIS and TWAIN drivers and KODAK Capture Software, Lite. And you can choose options like the dockable flatbed and a post-scan imprinter. All compelling reasons to convert to easier, more productive scannning with the i250.